Before the caravan season gets underway, one of the highlights in our calendar is The Caravan and Motorhome Show. The North’s largest outdoor leisure show, it is an outstanding showcase featuring more than 200 leading caravan manufacturers and dealers. For people looking to buy their first static caravan, considering an upgrade or looking for a park, it is also an opportunity to meet manufacturing experts and site owners. 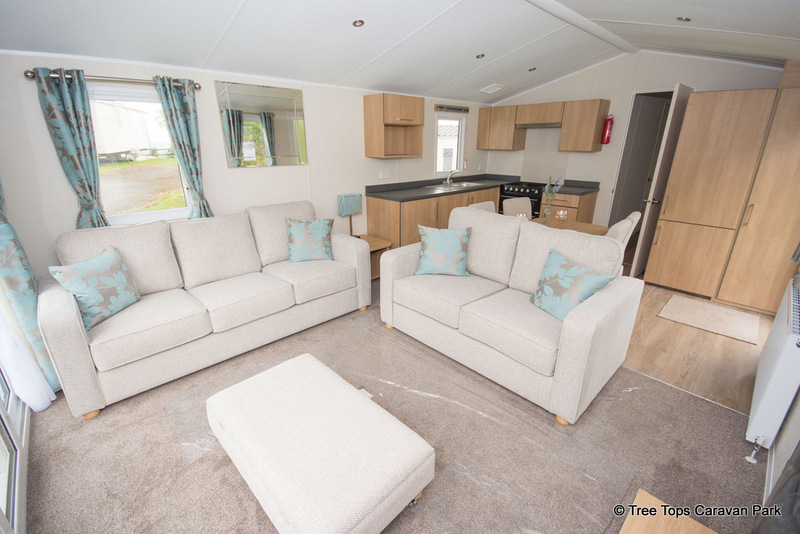 We exhibited alongside North Wales holiday homes specialists and Tree Top supporters Lloyds Caravans and Roy Kellet Caravans who took along two amazing caravans – the Willerby Impression and Carnaby Oakdale. The Impression, designed by Lloyds and Roy Kellet, certainly lived up to its name, making a big impression on visitors. At 35ft x 12ft it has all mod cons including two sofas, central heating, integrated fridge freezer, walk-in wardrobe and USB sockets. Affordable and stylish, I’m sure we’ll be seeing it in North Wales caravan parks soon. With its spacious interior and natural tones, the Carnaby Oakdale – already a firm favourite with holiday home owners – is equally impressive, packed with modern appliances and coming in a variety of sizes. But these weren’t the only caravans turning heads. Other manufacturers included ABI, Swift, Atlas, Prestige Park & Leisure Homes, and Omar all with stand-out units designed to entice anyone looking for a caravan as their holiday home. If you couldn’t make it to Manchester, then we’d be pleased to show you around and introduce you to our North Wales caravan park. Take a look at what we offer or just give us a call on 01745 560279 to arrange a visit.